After a fresh dumping of snow across the country, a friend and I decided to try and make the most of it with a short trip across to the Lake District. With only Monday off work, we decided to drive across Sunday night and walk into Warnscale Bothy (red dot) before getting up and spending the whole day in the fells. Our plan was to go up to Haystacks, then head down into Ennerdale before doing a loop around the valley and then back to where we had started, as shown below. We arrived at Honister slate mine at about 8pm and then started to make our way up and over before dropping down to the bothy. It was a beautiful evening, with the stars so clear above us, and we decided to take our time and practice night navigation and taking bearings with a map and compass. After popping our heads into Dubs Hut, another bothy close by, we arrived at Warnscale to find another photographer already there. We then spent the next few hours chatting, and despite the freezing temperatures, taking a few shots of the bothy from outside before settling into our sleeping bags. Having endured temperatures of -6 overnight, as well as some very hungry mice, we got up and decided to make the short walk up Great Round How for sunrise. With a loop planned we decided to fill a dry bag with our sleeping stuff, to avoid carrying it all day, and stashed it under a rock to return to later. Below was the view looking across Buttermere towards Whiteless Pike, Wandope, Robinson and Grassmoor. And just 20 minutes later the view had completely changed. 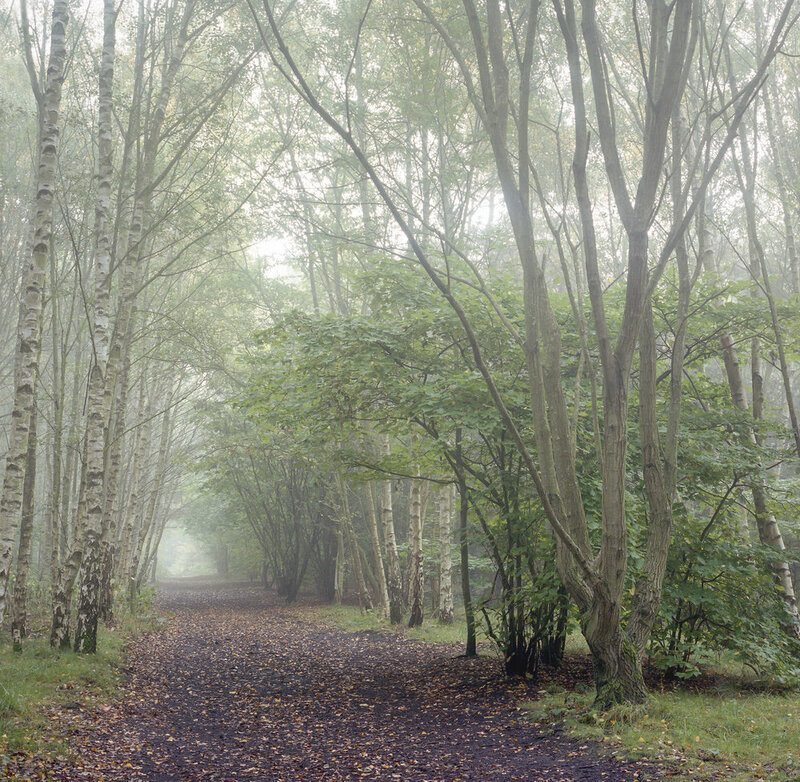 Lovely warm light had burst through and amazingly Grassmoor had vanished entirely, obscured by cloud. With the fast moving cloud the light was changing quickly so we spent quite a bit of time shooting in different directions as the scene changed. The view across the whole of Buttermere was the obvious thing to try and capture, but I felt more drawn to using my 70-200mm to try and pick out some more detailed images. Eventually we decided to set off from Haystacks and having had a bit of food we dropped down to Ennerdale from Scarth Gap. This was my first time in this valley and I was really impressed with the beauty of it, surrounded on all sides by big mountains. Covered in snow and ice it had a particularly magical feel and we enjoyed a slow potter along the river until we started the climb up to the shoulder between Kirk Fell and Pillar. By now cloud had started to cling to the tops, so instead of going for the summits we decided to navigate around them and started to make our towards Great Gable. The light continued to change quickly throughout the day and as we approached Beck Head Tarn the only other walker we met that day appeared above us. Quickly grabbing my camera I managed to get a shot of him, with Great Gable behind, before he started to descend and dropped below the ridge line. It was at this point the cloud really came in, creating a weird yellowy white out, and so after waiting round for a bit we decided to scrap our plan of sunset on top of Great Gable. With a fairly long walk back to the car ahead of us we decided to set off while there was still some light. But as we made our way round the top of the valley the clouds lifted for a few minutes, creating quite an eerie scene around Kirk Fell, just long enough for us to grab a few shots before darkness descended. Again we were able to navigate our way back in the dark, found our stashed bag and plodded back to the car to bring an epic 12 hours on the fells to a close. All that was left was to do was slowly make our way down an icy Honister Pass and onto home. With winter this year having been a bit of a disappointment, I was already starting to hope for better next time round. But when I saw a decent amount of snow was due to come down in Scotland on Tuesday last week, my hopes were raised. And they were raised even further when I saw the forecast for the following two days. So with a couple days off work to take, I set about planning a last minute trip and decided on Stob Ghabhar (1090m) - a summit which is part of the Black Mount range often pictured from the A82. 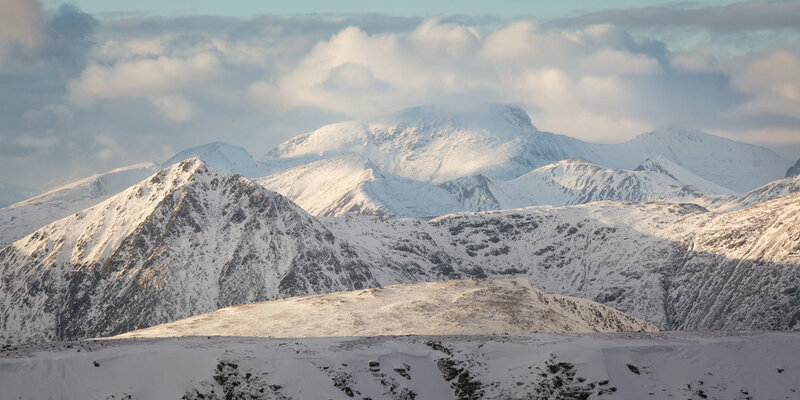 The WalkHighlands route includes the neighbouring Stob a'Choire Odhair, before cutting across and then up a steep north face onto Aonach Eagach (not to be confused with its famous namesake in Glencoe) and then onto Stob Ghabhar. However, with the avalanche forecast as considerable on north and north-east faces I decided to follow the route in reverse and leave out the second Munro. So parking at Victoria Bridge, I would make my way along the path before crossing the river and bearing left, as shown by the grey line and miss out the red line. 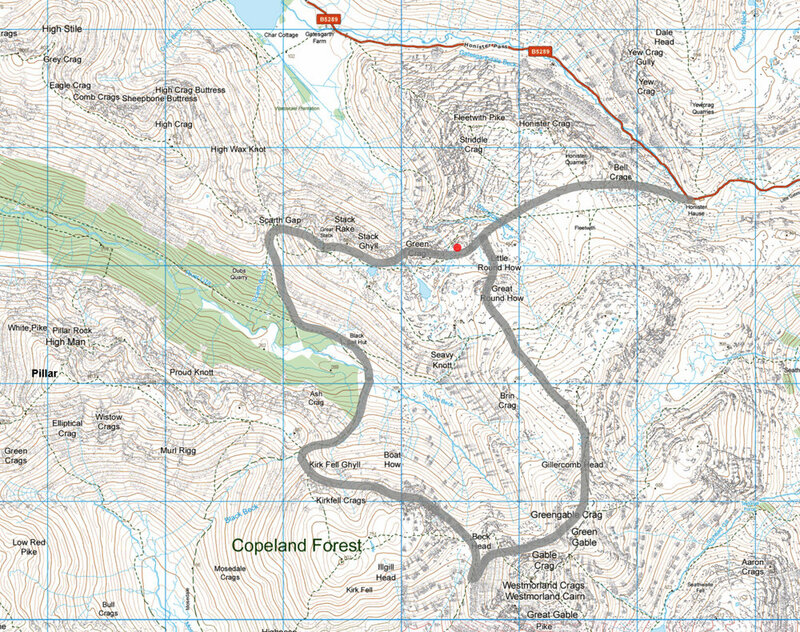 Having looked at the map I decided a good place to camp would be where I have circled in red, a flat bit of land with a lochan and stream next to it for fresh water. I would then just need to follow the ridge up to the summit and back down again after sunset. This was slightly lower than I would normally like to camp, leaving around 500m of ascent, but felt like the best bet. The walk in was very pleasant and included watching a herd of deer cross the river Abhainn Shira, which flows down into Loch Tulla. I eventually left the path to bear left and managed to cross the stream without getting my feet wet, leaving a fairly short but steep climb up past a beautiful waterfall to Coire na Muic. The camp spot (around 570m) was just right so I got set up and at about 3.45pm I decided to start making my way up to the top. The walk up was a bit slow, I had played football the night before and coupled with carrying a 20kg bag my legs already felt quite sluggish. The snow was quite soft, so easy enough to walk in, but what caught me by surprise was the strength of the wind . It had been forecast to be only 15-20mph, but was starting to feel much stronger and coupled with the fact the top of Stob Ghabhar was covered in cloud I started to think about abandoning the top for sunset and returning for sunrise. Above me you could see the spindrift was really starting to pick up so I took a few images where I was and began to think about returning to the tent. However feeling torn about what to do, I decided to go up a bit further just to see what it was like. As I did the clag on top began to clear slightly so again I went up a bit further. The clouds also seemed like they had potential for a nice sunset so eventually I decided just to go for it and thought if I can get something half decent now then it would save me the walk up in the dark the next morning. By now the wind was very strong though, unbalancing me at times, and along with the soft snow made for slow going. But I was rewarded with spectacular views the higher I got, such as this one across to the imposing figure of Ben Nevis. Time was pressing on and I could see the best light was going to be close. Eventually I reached the top and there followed about 45 minutes of strong winds, wild spindrift and amazing light which all combined to make some spectacular conditions. Taking pictures proved far from easy though as my goggles had started to steam up but I was unable to open my eyes without them on. Then for some reason my auto focus started cutting in and out and the shutter button began to freeze! It all made for a rather frantic experience, desperately trying to make sure I got something usable. But despite all that it was still one of those mountain experiences you dream about and the reason you go through all the pain of getting there. With the sun eventually descending below the horizon, all that was left was making my way back to camp in the increasing dark. In these conditions this would normally have been a little concerning, but thankfully the route was fairly straight forward just following the ridge back down. With this is mind I tried not to rush and a few times took a break behind some big rocks to get out of the wind for a few minutes. Eventually the sight of the tent was a welcome one and I was quickly in, changed into dry clothes and eating my freeze dried carbonara. Feeling shattered I decided I would stay close to the tent for sunrise and settled down around 9pm. Despite the freezing temperatures I enjoyed a cosy night, only disturbed by the wind, and the next day packed up and was back at the car for around 8.30am. 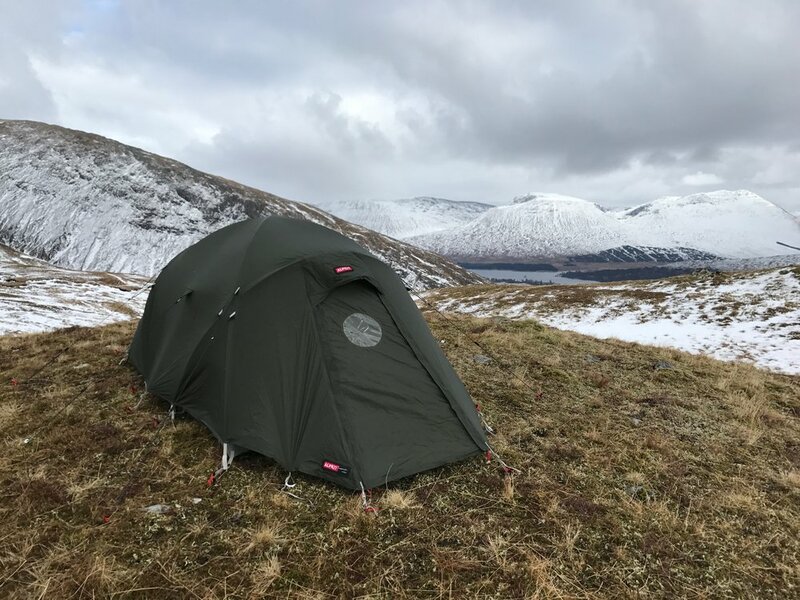 A month later I was back in Scotland for a short solo trip to Bridge of Orchy and a wild camp on Stob Ghabhar. This trip really pushed me mentally and physically, but despite the wild winds and blinding spindrift I enjoyed a spectacular sunset on top, with these two images taken 20 minutes apart. I then descended in the dark to my tent which I had pitched halfway up. I barely shot a frame during the summer months, but two family trips to the Lake District allowed me a bit of time in the hills. The top image is the view towards Crinkle Crags from a night in a bivvy on Pike O'Blisco and below is heather on Kings How, in Borrowdale. Here are two film shots I took this year, the left is a nature reserve I often walk in a few minutes from home and the right is from Borrowdale, the day Saharan dust turned the sky red. I made it back to Scotland in November, after taking the chance to get out in fresh snow and good conditions. 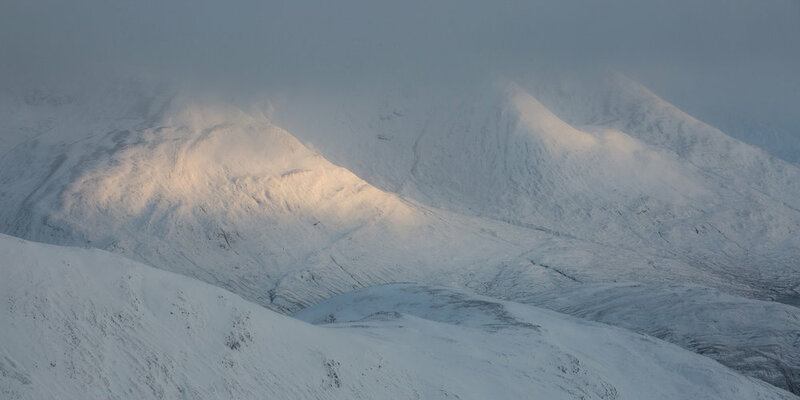 I decided to park in Glen Nevis and head up Stob Ban and came away with two of my favourite images of the year. And the year was rounded off with a 24 hour trip to the Lake District with a friend. 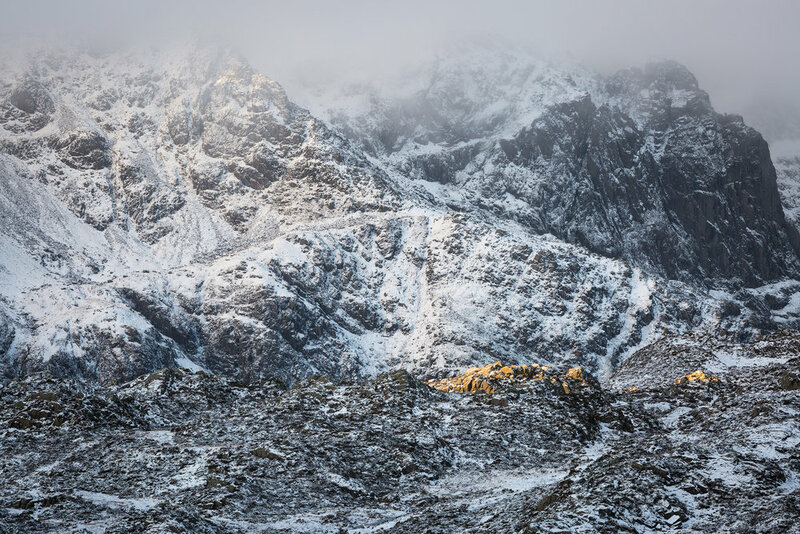 We slept in Warnscale Bothy, with temperatures dropping to -6, before spending 12 hours on the fells walking around Ennerdale and back.